The condition of acne actually begins forming beneath the skin long before we witness symptoms on the surface, and is actually attributed to a hormonal imbalance, which can affect the function of the sebaceous glands. These glands work to create sebum, or oil, which travels along the pore to hydrate and protect the skin on the surface. A hormonal imbalance or fluctuation can cause the sebaceous glands to go haywire, producing more sebum than is necessary, which can become clogged within a pore. When this sebum pairs with dead skin cells from the surface, bacteria known as P. acnes can become formed, which triggers an inflammatory response from the body. The result of that response usually appears as red, swollen bumps such as pimples or cysts, although symptoms of this condition can come in many forms, including whiteheads, blackheads, comedones, or even just oily skin. Although the symptoms of acne are what we aim to treat, it’s important to keep a routine in motion to prevent the formation of new blemishes in addition to eliminating existing ones. Here are some great tips to keep in mind to stay on track with your AcnEase treatments, which will ensure the best results! Don’t stray from the recommended dosage. Every AcnEase treatment is designed to treat a specific type of acne, which is why making sure you’re on the correct dosage is super important, otherwise the outcome can be severely affected. If you’re not sure what type of acne is affecting you, check out this helpful link to narrow it down, and if you have any questions regarding dosage instructions, please don’t hesitate to contact us! Our goal is to deliver clear and healthy skin to you as quickly as possible, so please reach out if we can help you meet your skincare goals! Commit to success. The time it will take to witness results will vary depending on the person - it really depends on the severity and chronic nature of acne. AcnEase treatments are sold in monthly regimens, and the recommended time to take it for a first-time user is AT LEAST one month, so if you want to see real results, stick to your treatment plan and do your best to not skip doses. Like any medication, adhering to the recommended guidelines is crucial, and AcnEase is no different! Be patient! If you’ve had chronic acne, whether mild or severe, it just isn’t going to go away overnight. Healing the skin is a process that takes time, and could take anywhere from 1-3 months (if not longer) to see results, so allow yourself some room and time to improve. If you feel that the dosage you’ve been taking is too low for you, please contact us and we will be happy to help guide you in the right direction. Weaning off. When you see the desired results and want to come off of AcnEase, our suggestion is to ween off of it slowly. Stopping abruptly could cause a change that your system doesn’t like. So you would go down gradually, for example, from 6 x 3/day, to 4 x 3, then 4 x 2, then 2 x 2 - and you can do this over a 1-2 week period or longer depending on how your body reacts. If you see that your skin reacts negatively, you just go back up to the dosage that didn’t give you that type of reaction. If you’d like to stay on a maintenance dose (2 x 2) after you wean off, you can do this too – we have many clients who do so. So just how does AcnEase work to treat acne from within? By using safe and effective herbal ingredients, AcnEase works to create a buffer between the hormones and sebaceous glands, ensuring that only the amount of oil needed to properly hydrate the skin is produced - no more, no less. This means no harmful side-effects as the function of the hormones will not become affected by treatment, and because it limits the amount of sebum produced to only what’s needed, you won’t have to play those frustrating guessing games with a topical wash that may overdry the skin. 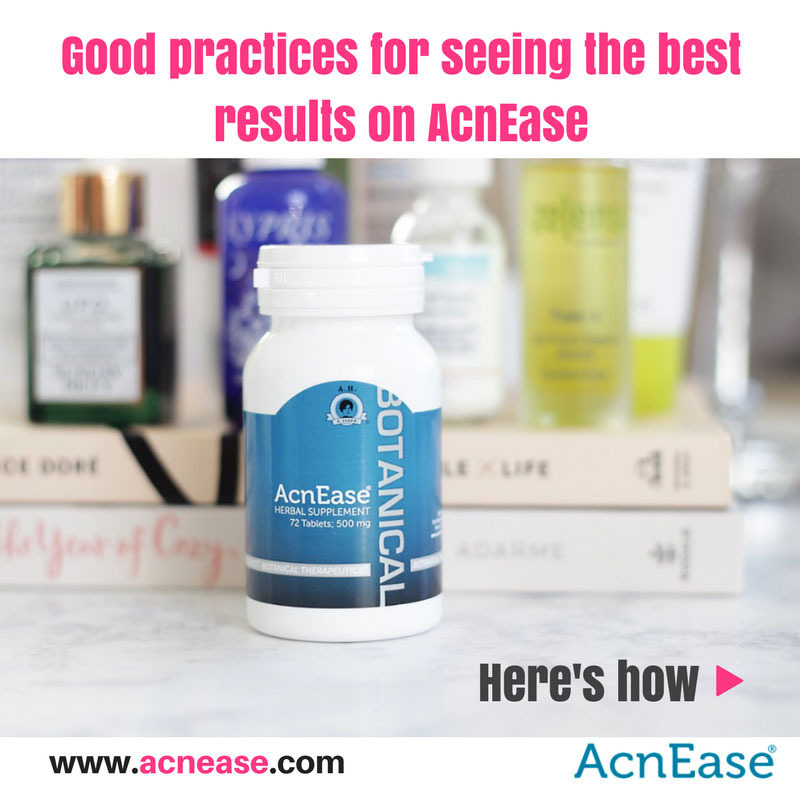 AcnEase is formulated to treat all types of acne, from blackheads to bacne to cysts, mild or severe, and with a 96% user success rate, it can make for a great solution for anyone with especially stubborn symptoms who have struggled to find relief elsewhere. AcnEase works to treat existing symptoms while preventing new acne formation before it starts, so think prevention to eliminate the endless cycle once and for all. We would love to hear from you! 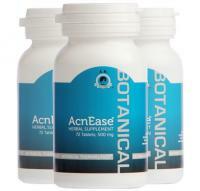 What has been your experience with AcnEase? Have any additional tips for making the most of your time on treatment? Tell us in the comments!